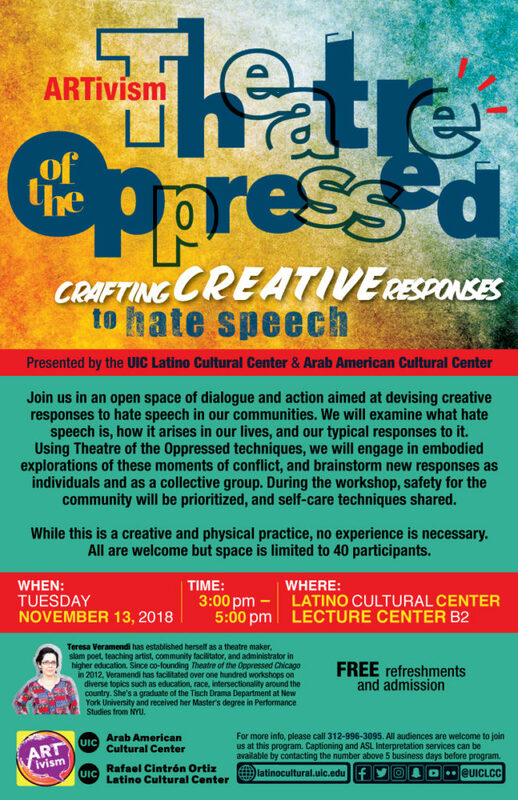 Join us in an open space of dialogue and action aimed at devising creative responses to hate speech in our communities. We will examine what hate speech is, how it arises in our lives, and our typical responses to it. Using Theatre of the Oppressed techniques, we will engage in embodied explorations of these moments of conflict, and brainstorm new responses as individuals and as a collective group. During the workshop, safety for the community will be prioritized, and self-care techniques shared. While this is a creative and physical practice, no experience is necessary. All are welcome but space is limited to 40 participants. Teresa Veramendi has established herself as a theatre maker, slam poet, teaching artist, community facilitator, and administrator in higher education. Since co-founding Theatre of the Oppressed Chicago in 2012, Veramendi has facilitated over one hundred workshops on diverse topics such as education, race, intersectionality around the country. She’s a graduate of the Tisch Drama Department at New York University and received her Master's degree in Performance Studies from NYU.